Michael Ingalls, Chef Doug Winslow, Heather Vigue and Adam Vigue, all of Sodexo. FARMINGTON - The Franklin County Chamber of Commerce is very proud to announce the winner of our “Taste of Farmington” event that was held as part of our Chester Greenwood Day celebration! 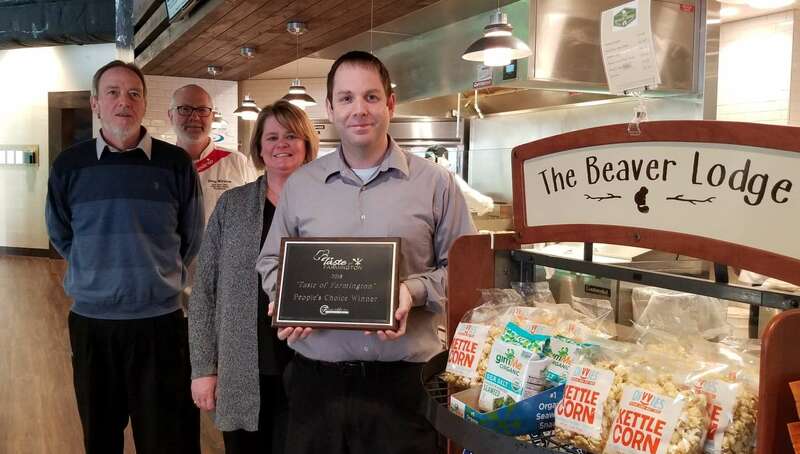 Drumroll please ... and the winner is The Beaver Lodge, Sodexo at University of Maine at Farmington. The Beaver Lodge offered a sample of butternut squash soup, an avocado and crispy chicken wrap, along with a smoothie sample. This day was made even more fun by Passport holders of this event, casting their votes at the Festival of Trees. When our community comes together, there is no stopping the fun! We hope to make this an even bigger event next year. Thank you to all who participated!